Kandinsky was among the avant-garde artists who were forced to flee Germany in 1933. Shortly after the Nazi Government closed down the Bauhaus, he settled in Neuilly-sur-Seine, near Paris, and was granted French nationality in 1939. 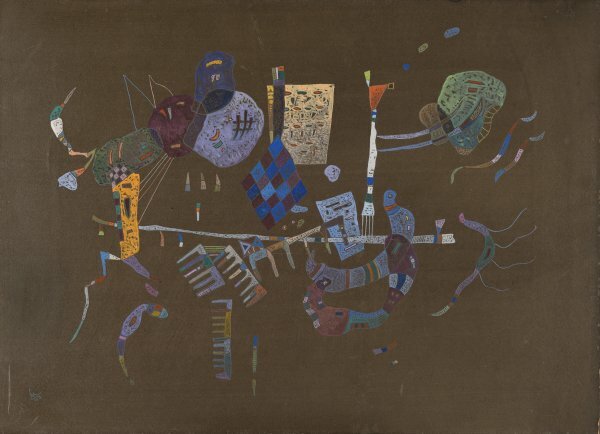 Around the Line, recorded as number 710 on the artist’s handwritten list, where it is dated February 1943, is one of the last works painted by Kandinsky in the French capital. It bears a strong resemblance to an earlier work belonging to The Solomon R. Guggenheim Museum in New York, Around the Circle, and especially to the preparatory sketch for the latter, which has led Peter Vergo to regard the present oil painting on cardboard as possibly another preparatory drawing for a larger canvas. Although Kandinsky would continue to explore the expressive and abstract possibilities of the circle and the line until the end of his life, these works, like those of his final period, are characterized by a freer style that is close to the painting of his great friend Paul Klee and the anthropomorphic representations of Joan Miró, and a far cry from his more Constructivist period at the Bauhaus. Vivian Endicott Barnett considers these biomorphic forms to be proof of Kandinsky’s interest in the organic sciences, such as zoology and botany, and points out his fondness for making scrapbooks containing pictures of insects and embryos cut out of scientific journals, which he used as a source of inspiration for his works.